Twenty-five years ago today, BBC correspondent Michael Buerk filed this report on Ethiopia's now infamous famine. I watched it again today, and I had forgotten how harrowing it was. For me the worst image wasn't the skeletal corpses of young children. It was hundreds of desperate people tottering across the plain on stick-thin legs, using up what little energy they had left in a shaky sprint prompted by the rumour of a food delivery. Buerk's dispatch prompted Band Aid's "Do They Know Its Christmas?" single and the subsequent Live Aid concerts, raising millions of pounds. But over a million people still died. So, 25 years later, have we learned anything from the Ethiopian famine? Not according to Oxfam. Its report, Band Aids and Beyond, says donors are still focusing on "knee-jerk" emergency food deliveries rather than trying to prepare communities for drought and developing local capacity. Ethiopia proved Oxfam's point on Thursday, appealing for emergency food aid to feed 6.2 million people. Across the East and Horn of Africa 23 million people are facing hunger and need assistance. Should we be surprised by this? Drought has long been a problem in the region, and is just going to get worse as climate change hits home. Yet hardly any money is flowing into programmes designed to help communities cope by doing simple things like collecting rain water. Late last year, I travelled around the border region of Kenya and Ethiopia, visiting communities hit by the long-term drought. Not one of the village I visited were doing anything to help themselves, other than to buy guns to steal cattle and pasture from other tribes. So why are these communities so passive? Because they are used to receiving massive dumps of food aid or having water trucked in by Western donors. They are happy to sit and wait for aid workers to come and do for them simple things they could do themselves - like putting up guttering and storage tanks to collect water when it does rain. Even that task has been farmed out to donors, who are doing too little of that kind of work. The guy I was travelling with - who worked for a donor agency doing some small-scale work in drought preparedness - has worked in the region for over two decades and witnessed the growing dependency on aid. At a village meeting under an acacia tree, he went as far as telling the community they had "turned into a bunch of beggars". He was right, except it isn't really their fault. We have turned them into a bunch of beggars. Commercial and political interests lie behind the focus on food aid, and the US is simultaneously the biggest donor and culprit as Nicholas Martlew, the author of the Oxfam report, told me. "There have been attempts to de-link aid from narrow commercial interests, but the US farm lobby has blocked progress," he said. "There are also political reasons (for food aid): it looks good to have sacks of food sent by the US people arriving in disasters-hit regions." 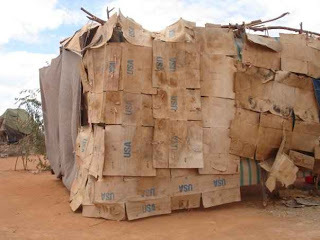 You only have to look at the makeshift shelters thrown up by refugees to see how much food the US dumps on communities - empty cans, boxes and sacks bearing prominent US logos are a popular and readily available building material, as evidence in the photograph, taken at Dadaab refugee camp. Sending food aid is expensive for the US taxpayer, according to Oxfam costing up to 2 dollars to pack and ship each dollar of food. But the powerful farm lobby is not keen to see US dollars being given directly to people in developing countries to buy food locally, as many economists and charities are now recommending as a way of developing local markets. The new US administration says it wants to change its focus to help local farmers produce more. This year, the US committed 3.5 billion over three years to help increase global food security. By contrast, in 2008, Food for Peace – the US’s main food aid programme – spent 2.6 billion dollars delivering food produced in the US to 49 countries. So there is still some way to go. But at least it appears to be a move in the right direction. It is clear that food aid cannot be just cut off. But until donors start shifting funding toward pre-emptive measures, they and the countries they are trying to help will be caught in a reactive and expensive cycle of aid dependency. And that is not good for anyone.